DENVER (CNS) — Colorado Governor John W. Hickenlooper declared a state of disaster emergency in response to massive flooding across 15 counties, from south of Colorado Springs to the Wyoming border, caused by several days of heavy rain fall that began Sept. 11. As of late afternoon Sept. 16, authorities confirmed that at least eight people have died in the disaster and about 600 people remained unaccounted for in the flood zone, which an AP story described as covering “an area nearly the size of Connecticut.” Flooding along the Front Range was moving east across the prairie to Sterling, about 128 miles northeast of Denver. With Hickenlooper’s declaration, the state began making resources available to search and rescue flood victims, help flood survivors, provide emergency services and begin help to assist with flood recovery. 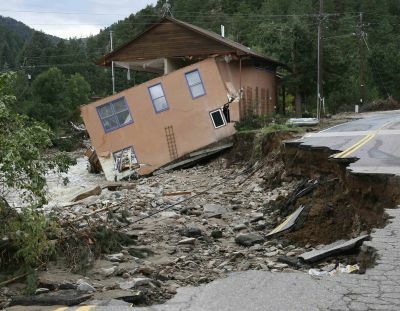 On the federal level, President Barack Obama signed a disaster declaration and ordered federal aid for Colorado. Obama also was sending the head of the Federal Emergency Management Agency to the state. According to several reports compiled by KMGH-TV Channel 7 in Denver and based on state agency estimates: 11,750 people to date had to be evacuated, with a number of people airlifted out of harm’s way by helicopter crews; 17,494 homes were damaged and 1,502 homes destroyed; and in the three hardest hit counties alone — Larimer, Boulder and Jefferson — 2,380 square miles were flooded. Areas scarred by recent forest fires — both in the Colorado Springs area and in northern Colorado — were particularly vulnerable to flooding. Denver Archbishop Samuel J. Aquila said in a Sept. 12 statement he was praying for all those affected by extensive flooding in northern Colorado and urged all people of good will to join him in prayer. He said was “praying for the souls” of those who had died and for their families. The Colorado State Council of the Knights of Columbus issued a call for manpower to help get supplies to Red Cross shelters. “This recent storm is breaking records; more shelters are now open then ever recorded in the state. We have supplies but are desperate for manpower. Please Help,” the council said in a Sept. 13 message to Knights. As much of the rest of Colorado scrambled to stay out of the path of raging floodwaters, residents of beleaguered Manitou Springs and other small mountain towns along the Highway 24 corridor gave thanks that, for now anyway, they were out of harm’s way. 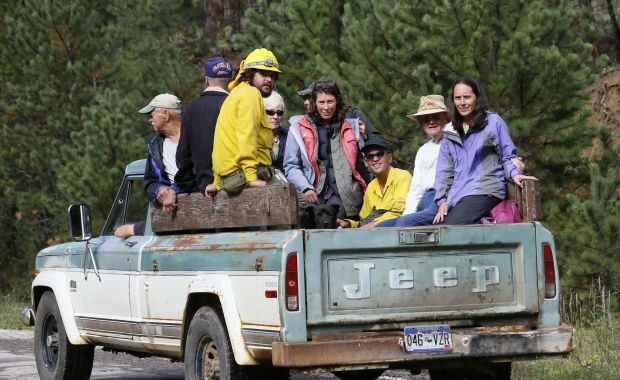 “We’re all good,” a woman at the parish office of Our Lady of the Woods in Woodland Park, said Sept. 13 to The Colorado Catholic Herald, newspaper of the Colorado Springs Diocese. In early August, parts of Manitou Springs — which relies heavily on tourism to support local businesses — had been devastated by mudslides created when heavy rains fell over the burn scar from last year’s Waldo Canyon fire. One month later, parishes closer to downtown Colorado Springs were the ones feeling the heaviest impact of from flooding. Offices at St. Mary Cathedral in downtown Colorado Springs sustained serious water damage, the diocese reported Sept. 13. At St. Paul Church on the southwest side of Colorado Springs, the parochial school was closed Sept. 13 because it was without phone or Internet service. The parish rectory was also “soaked,” said a member of the office staff. Contributing to this story was Veronica Ambuul, assistant editor of The Colorado Catholic Herald, newspaper of the Diocese of Colorado Springs.